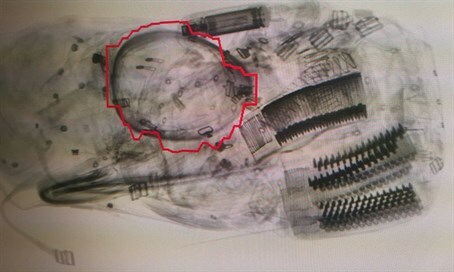 Sde Dov Airport security shocked to find grenade, ammo magazines and dozens of assault rifle bullets in bag of female passenger. Security personnel at the Sde Dov Airport in Tel Aviv on Wednesday morning seized weapons including a hand grenade, ammunition magazines and dozens of assault rifle bullets in the luggage of a female passenger. The passenger, an Israeli resident of Eilat who arrived for the morning flight from Tel Aviv to Eilat, was asked about the contents of her luggage as is standard protocol. She claimed that her baggage did not contain any forbidden objects. However, during the scanning of her suitcase the inspectors were surprised to find the lethal weapons there among her belongings. Due to the discovery of the grenade the airport launched its security protocol to evacuate the luggage until a police bomb squad member arrived. The passenger was transferred to police investigators for questioning, and claimed to them that the suitcase belonged to a family member. Following the incident, the airport authority has called on passengers on domestic and international flights to thoroughly check the contents of their luggage.